Start the course off with a solid shot off the tee and an easily avoided water hazard on the left, leaving a simple approach shot into a receptive green free of bunkers and hazards. While this is reachable in two with a well-placed drive as long as you miss the fairway bunker, your approach to the green will be a little more demanding as there are bunkers on both sides of the three-tiered green. Short but not easy, the third hole has two bunkers protecting its hilly fairway, making a seemingly straightforward hole much more difficult. This dogleg right requires a well-placed tee shot around 215 yards, leaving you with a short iron uphill to our most recognized green: a two-tiered green with an eight-foot elevation change. The toughest hole on the front nine, Hole 5 is a dogleg left that requires a tee shot favoring the left side of the fairway to provide the best view for your approach. The shortest par 4 on the course gives long hitters the chance to reach the green from the tee shot. With only one greenside bunker, the reward is much greater than the risk. Tee shots favoring the right side of the fairway will steer clear of the fairway bunkers and provide the best angle for approach. The two-tiered green narrows at the back with bunkers on both sides. 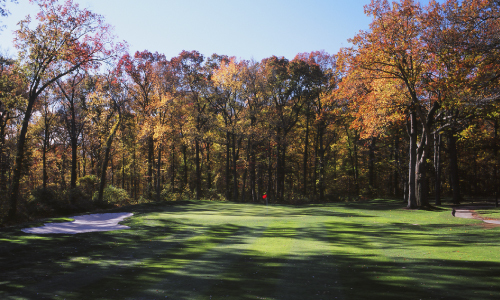 The eighth hole’s sprawling green features one large undulation in the center, making placement crucial on your tee shot. Wrap up the front nine with another very reachable par 5. A tee shot in the fairway will allow you to lay-up before the fairway bunker, or if you’re feeling ambitious, you can go for the green. This is one of the few holes without a greenside bunker. The back nine begin with the longest par 4 on the course, which is also one of the straightest holes at Pelham Bay. The only trouble you’ll find are the bunkers 20 yards short-left of the green. A slight dogleg left with little trouble will allow you to be aggressive with your tee shot and cut the corner. With a solid drive, you’re only a wedge away from a pleasantly receptive green. The two-tiered green on Hole 12 looks easy from the tee, but a miss on either side will land you 10 feet below in the course’s deepest bunkers. Keep your tee shot in the fairway for the best chance at holding this elevated green. The fairway slopes down toward a creek running across the fairway, 40 yards short of the green. This uphill dogleg left is the longest hole on the course. Your second shot will play uphill and blind with a fairway bunker on the right. An aggressive third shot will be rewarded as you’ll be aiming at the largest green on the course. Off the tee, you’ll hit slightly uphill and over a small pond. With only one bunker through the fairway, a solid drive will be rewarded, leaving you with a short wedge into another two-tiered green with greenside bunkers. The longest par 3 on the course features a green surrounded by grass mounds but no greenside bunkers. Favor the right side of the fairway bunker and let it rip. The green, angled left-to-right, has a bunker guarding the right and back, but be careful; the bunker is not visible from the fairway. Your approach shot will look somewhat intimidating with a fairway bunker and fescue grass blocking your view of the green. Take dead aim at the pin on the course’s most undulating green and hope that your luck carries through this last hole. 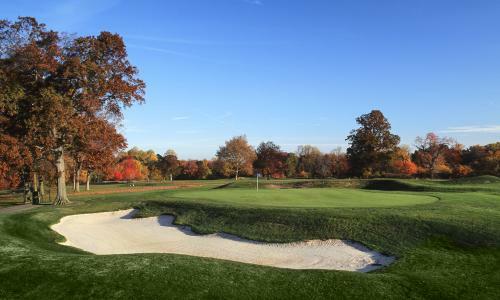 Designed 30 years apart by two separate architects, Pelham Bay and Split Rock Golf Courses complement one another with exhilarating play and challenging hazards—including tiered greens, elevated tee shots, deep bunkers, and thick forests lining the fairways—that maintain distinct personalities, keeping each game interesting. 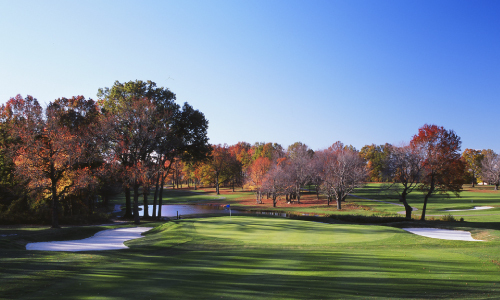 Conveniently located near bridges connecting Long Island and New Jersey to the Bronx, the pair of courses is easily accessible from all five boroughs, the surrounding suburbs, and even Connecticut. 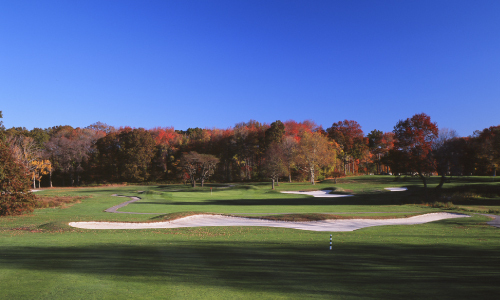 Measuring 6,480 yards and 6,682 yards, respectively, Pelham Bay and Split Rock feature such highlights as Pelham Bay’s wide, beginner-friendly fairways and undulating greens. 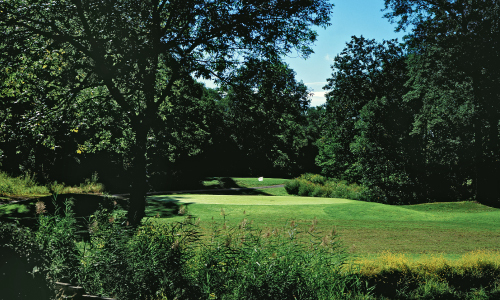 There’s also Split Rock’s famous “Amen Corner,” which begins with a 515-yard approach shot uphill on a par 5, followed by a 220-yard par 3 that requires golfers to hit a long iron uphill to a petite green, then the most difficult hole on the course (a 447-yard par 4 where par is something to be proud of), and concluding with a 441-yard par 4 that forces long hitters to lay-up in order to avoid a creek, leaving them with a long approach shot into a protected green. 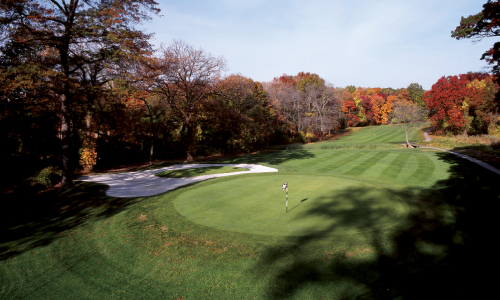 To prepare yourself for these challenges, you may want to visit Pelham Bay and Split Rock’s full-size putting and chipping green. (718) 885-1258 or click here.